If you live at the southwestern tip of Africa and you don’t know that the region faces a water crisis of note you must have been asleep under a rock for the past year or so. Every local newspaper and radio station has been carrying pretty well daily updates and discussions on the subject. We are having to come to terms with the concept of Day Zero: the day on which (unless we are inundated by sustained out-of-season, monsoon-heavy rains) we open our taps and nothing comes out. And when is Day Zero? The best guess is on or around 21 April or a frighteningly short 100 days from now. “We aim to get the Wednesday Water File updates out on Wednesdays as we understand that the City updates its information on Tuesdays,” says Christine Colvin, WWF’s Senior Manager Freshwater Programme. with WWF South Africa. In their first offering, Christine and her team address 10 crucial points. 1 When is Day Zero likely to happen? At present, Day Zero is calculated to be about three months away on 21 April. This day is calculated based on knowing how much water is in the Big Six dams that feed Cape Town and the Western Cape Water Supply System, and knowing how much water is being used by the city’s residents, by agriculture and what is evaporating out of the dam. Day Zero is a worst-case scenario but it has been inching closer since the City of Cape Town began predicting it. As of 15 January, the dams were 28% full and if we continue using water at the current rate we will run out of water on 21 April. This calculation assumes that we can’t use the last 13.5% of water in the dams and that there are no new sources of water available by this date. Substantial new water sources are not likely to come on line before April, so the only thing that can really push out Day Zero is if YOU and I use less water and save water NOW! 2 What is likely to happen on Day Zero? 3 I hear that Day Zero is longer than a day, how long will Day Zero last? 4 When are the new water sources expected to come online? 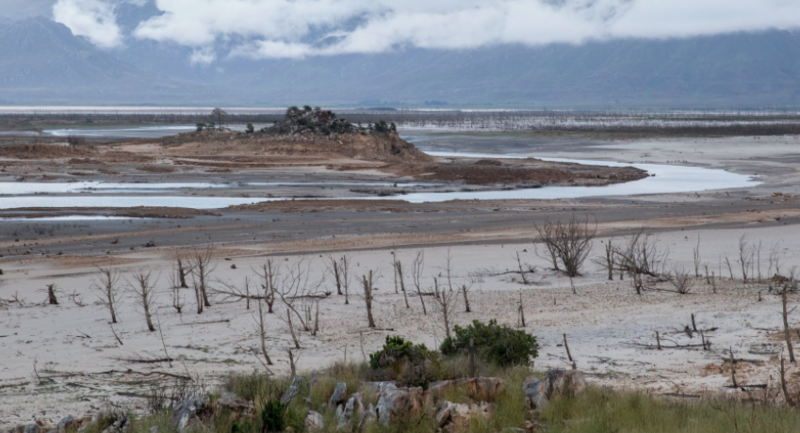 5 Drought-stricken Beaufort West also relied on groundwater and it has now dried up. How confident are we that we have enough groundwater? 6 If I’m not strong enough to fetch and lift my city allocation of water, how will I get water? During times of crisis, we need to look after each other more than ever, especially people who are elderly and not able to get water from the new sources that become available. Whatever happens, it’s likely that you will have to queue, carry and in some cases treat your own water. We’re going to need to get to know our neighbours better and assist them where possible. You might have an elderly neighbour who is not on social media and doesn’t have access to this information – please print it out for them and start the conversation about looking out for each other. We’ll be making detailed suggestions soon about what neighbourhoods can do to get ready to get through the crisis together. If you are worried about your own ability to fetch or carry water start speaking to friends, neighbours and family now. 7 Is it already too late to buy a rainwater harvesting tank and think about saving water? It’s never too late to save water – we can only save it now while we have it! Because the municipal mains system will take time to be able to recover and deliver water, we will have to wait for enough rain to fall for the rivers to start flowing and fill up our dams. So you’ll get rainfall on your property before you get water out of your tap. It is still worth planning to supplement your household water sources as much as possible (if you haven’t done so already!). 8 I’ve been flushing my toilet with grey water, but on Day Zero we won’t have enough grey water to flush – what about the toilets? That’s true – there may not be enough to flush. Come Day Zero we will have to use very small volumes of water in our households – whatever you can carry in a bucket or container from a point of distribution or from a shop, or transport in a car or in a wheelbarrow from a neighbour’s borehole. It’s very likely you’ll have to think about alternate ‘dry’ sanitation systems at home. Some people might build temporary pit latrines and people in apartments are going to need smaller, mobile, dry systems. We’ll be talking to some dry sanitation experts about what is possible at home and sharing that in a later Wednesday Water File. 9 Will my office still be open? It’s likely that many businesses will not be able to stay open – either because they rely on large volumes of water for their core functions or because they are not able to offer safe water and sanitation to employees for their time at work. Start talking to your boss and your colleagues now: How are your premises prepared for Day Zero, and how can you work remotely, via the cloud, if not? How many people will need to stay at home because their children’s schools are closed? 10 Should we stockpile water and store it? Make sure you have a minimum EMERGENCY SUPPLY of drinking water at home and start using clean used bottles to store water.